The below chart illustrates the portfolio manager’s long-term track record of managing clients’ wealth across various market cycles and conditions. Source: TAM Asset Management Ltd. Figures shown above are for TAM’s existing Focus portfolio range which will be mirrored by the Mainstream portfolios available through Greenfinch. Performance figures shown are for the period 1st April 2014 to 31st March 2019. Past performance is not necessarily a guide to future returns. The value of investments and the income from it, may go down as well as up and may fall below the amount initially invested. This real world cumulative achieved performance is net – ie. The numbers include the deduction of all fees. Source: TAM Asset Management Ltd. The figures shown above are for TAM’s Ethical portfolio range which will be mirrored by the Ethical portfolios available through Greenfinch. 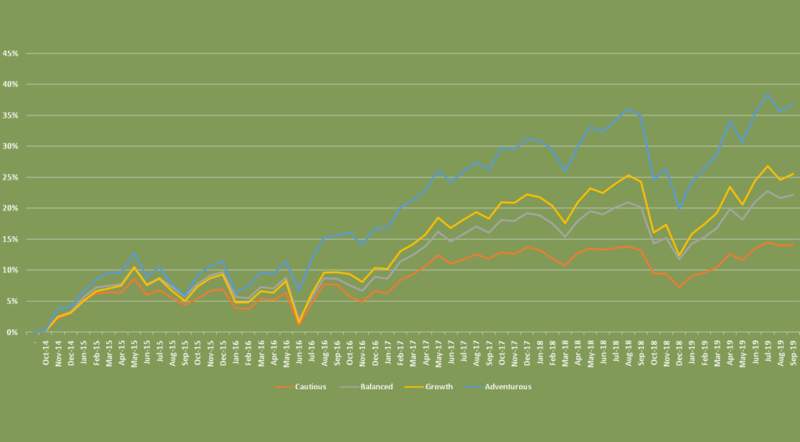 Performance figures shown are for the period 1st April 2014 to 31st March 2019. Past performance is not necessarily a guide to future returns. The value of investments and the income from it, may go down as well as up and may fall below the amount initially invested. This real world cumulative achieved performance is net – ie. The numbers include the deduction of all fees.